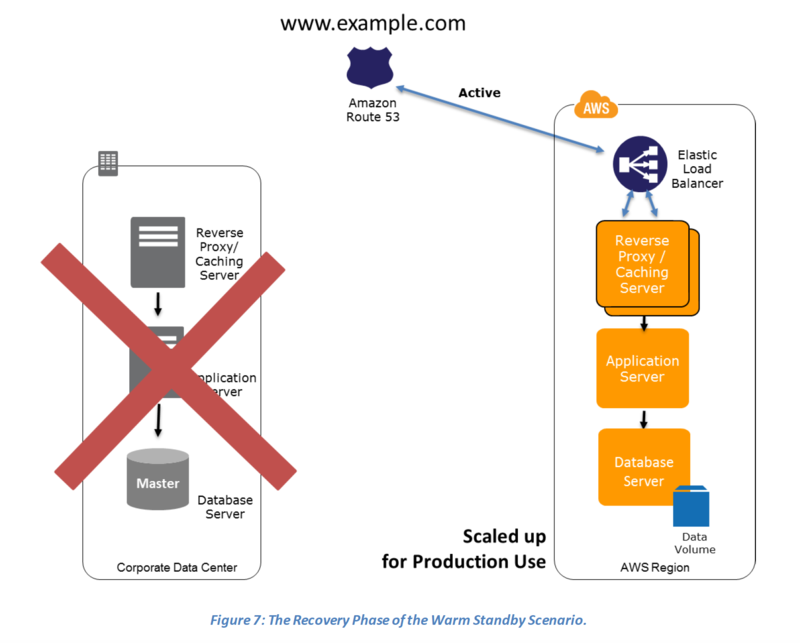 AWS Disaster Recovery whitepaper highlights AWS services and features that can be leveraged for disaster recovery (DR) processes to significantly minimize the impact on data, system, and overall business operations. provides a highly durable (99.999999999%) storage infrastructure designed for mission-critical and primary data storage. provides extremely low-cost storage for data archiving and backup. Objects are optimized for infrequent access, for which retrieval times of several (3-5) hours are adequate. provides the ability to create point-in-time snapshots of data volumes. a service that provides seamless and highly secure integration between on-premises IT environment and the storage infrastructure of AWS. provides resizable compute capacity in the cloud which can be easily created and scaled. addresses are static IP addresses designed for dynamic cloud computing. is an application management service that makes it easy to deploy and operate applications of all types and sizes. Environment can be defined as a series of layers, and each layer can be configured as a tier of the application. has automatic host replacement, so in the event of an instance failure it will be automatically replaced. can be used in the preparation phase to template the environment, and combined with AWS CloudFormation in the recovery phase. 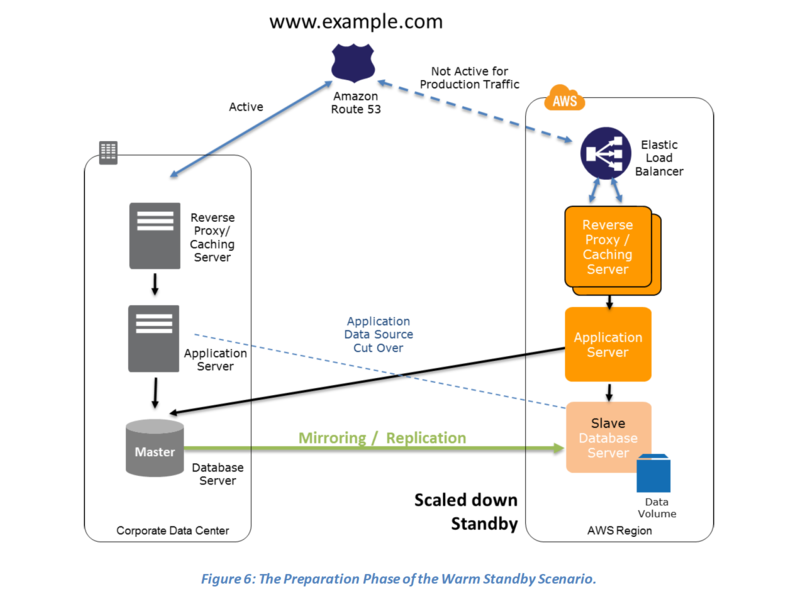 Stacks can be quickly provisioned from the stored configuration to support the defined RTO. Recovery Point Objective (RPO) – The acceptable amount of data loss measured in time before the disaster occurs. for e.g., if a disaster occurs at 12:00 p.m (noon) and the RPO is one hour, the system should recover all data that was in the system before 11:00 a.m. 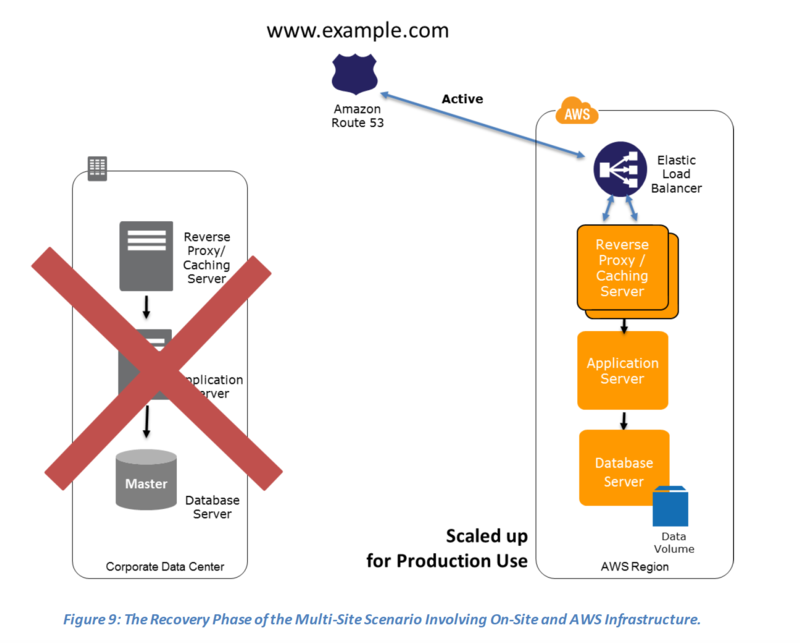 Disaster Recovery Scenarios still apply if Primary site is running in AWS using AWS multi region feature. Combination and variation of the below is always possible. AWS can be used to backup the data in a cost effective, durable and secure manner as well as recover the data quickly and reliably. 1. Select an appropriate tool or method to back up the data into AWS. 2. Ensure an appropriate retention policy for this data. 3. Ensure appropriate security measures are in place for this data, including encryption and access policies. 4. Regularly test the recovery of this data and the restoration of the system. Maintain a pilot light by configuring and running the most critical core elements of your system in AWS for e.g. Databases where the data needs to be replicated and kept updated. Ensure that all supporting custom software packages available in AWS. Consider automating the provisioning of AWS resources. Start the application EC2 instances from your custom AMIs. Add additional database/data store instances to give the DR site resilience in the data tier for e.g. turn on Multi-AZ for RDS to improve resilience. This setup can be used for testing, quality assurances or for internal use. In case of an disaster, the system can be easily scaled up or out to handle production load. Run the application using a minimal footprint of EC2 instances or AWS infrastructure. Either manually change the DNS records, or use Route 53 automated health checks to route all the traffic to the AWS environment. Consider using Auto Scaling to right-size the fleet or accommodate the increased load. 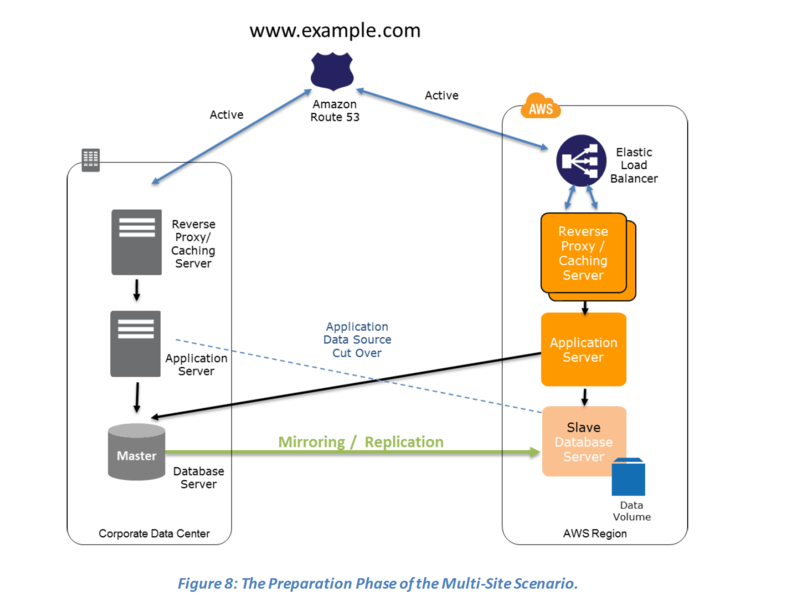 Multi-Site is an active-active configuration DR approach, where in an identical solution runs on AWS as your on-site infrastructure. Traffic can be equally distributed to both the infrastructure as needed by using DNS service weighted routing approach. In case of a disaster the DNS can be tuned to send all the traffic to the AWS environment and the AWS infrastructure scaled accordingly. Set up your AWS environment to duplicate the production environment. Set up DNS weighting, or similar traffic routing technology, to distribute incoming requests to both sites. Which of these Disaster Recovery options costs the least? You are designing an architecture that can recover from a disaster very quickly with minimum down time to the end users. Which of the following approaches is best? 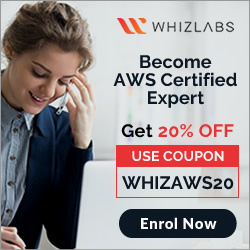 Your customer wishes to deploy an enterprise application to AWS that will consist of several web servers, several application servers and a small (50GB) Oracle database. Information is stored, both in the database and the file systems of the various servers. The backup system must support database recovery, whole server and whole disk restores, and individual file restores with a recovery time of no more than two hours. They have chosen to use RDS Oracle as the database. Which backup architecture will meet these requirements? 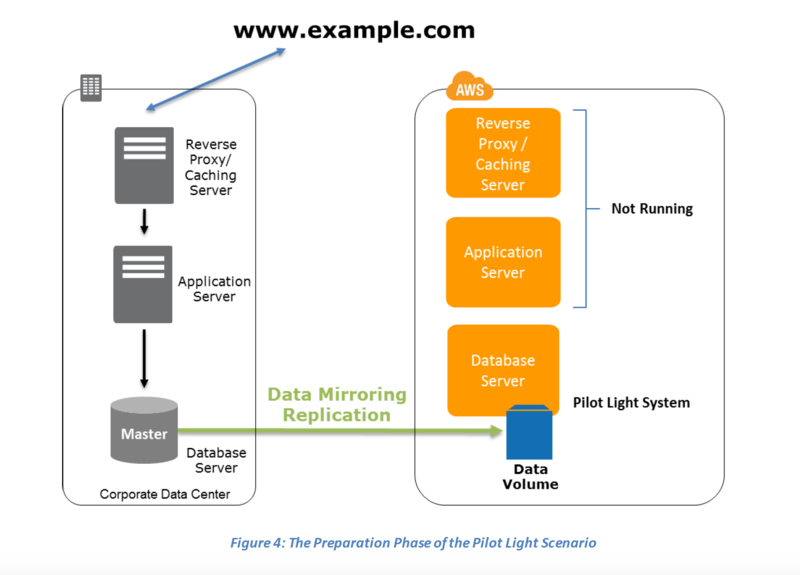 Which statements are true about the Pilot Light Disaster recovery architecture pattern? An ERP application is deployed across multiple AZs in a single region. In the event of failure, the Recovery Time Objective (RTO) must be less than 3 hours, and the Recovery Point Objective (RPO) must be 15 minutes. The customer realizes that data corruption occurred roughly 1.5 hours ago. What DR strategy could be used to achieve this RTO and RPO in the event of this kind of failure? 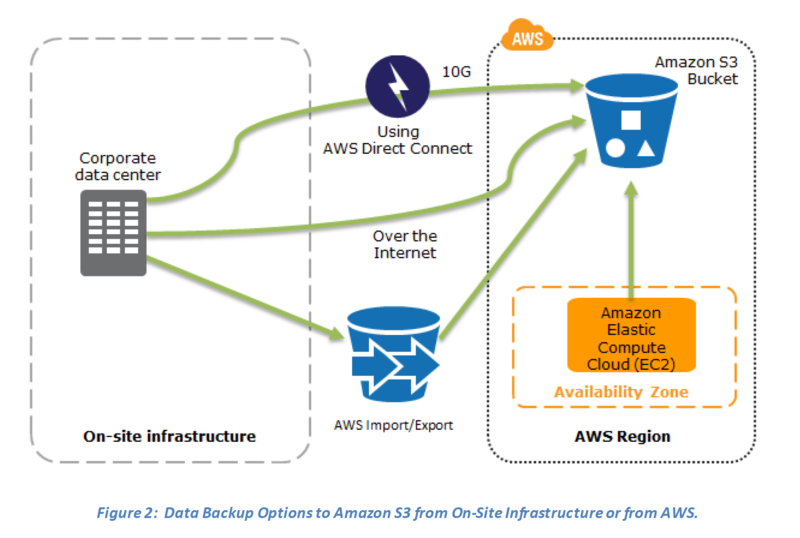 – Static Content – stored on a 512GB gateway stored Storage Gateway volume attached to the application server via the iSCSI interfaceWhich AWS based disaster recovery strategy will give you the best RTO? Deploy the Oracle database and the JBoss app server on EC2. 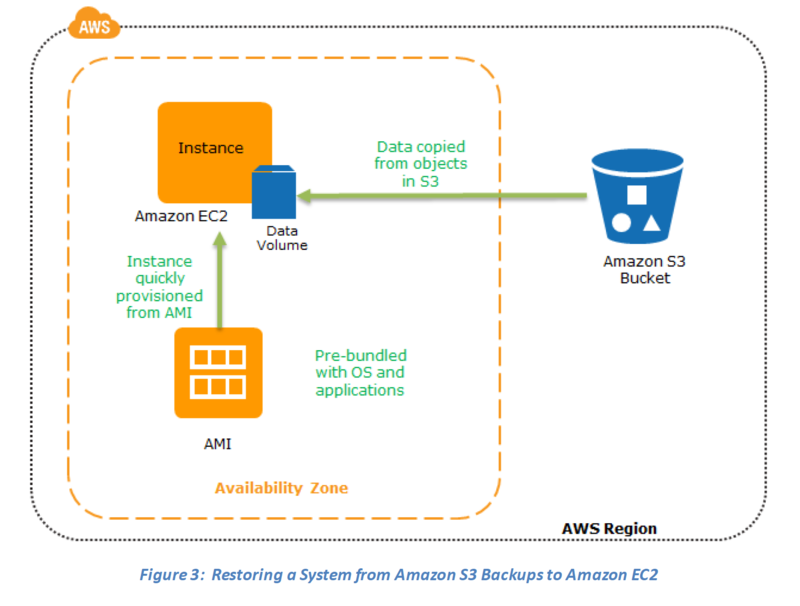 Restore the RMAN Oracle backups from Amazon S3. Generate an EBS volume of static content from the Storage Gateway and attach it to the JBoss EC2 server. In my opinion, Option 4 uses an external backup tool. Q4 should be A as the question is about recovery and not HA. RDS Multi-AZ is a High Availability tool not a backup tool. e.g. How would you recover from a corrupted database? You can’t with multi-AZ only from an actual database backup. Thanks M@ximus Agreed on the same, have corrected the same. Automated Backups with transaction logs can help in recovery. Jay, Are all the section contents up-to-date? There are many 2016 dated sections, so I’m a bit skeptical, at the same time, I like the complete consolidation here. I want to be sure, before I relay on the materials. Most of the topics are updated as and when i get time. The Whitepapers would reflect the old content, and might be new ones, so research accordingly. 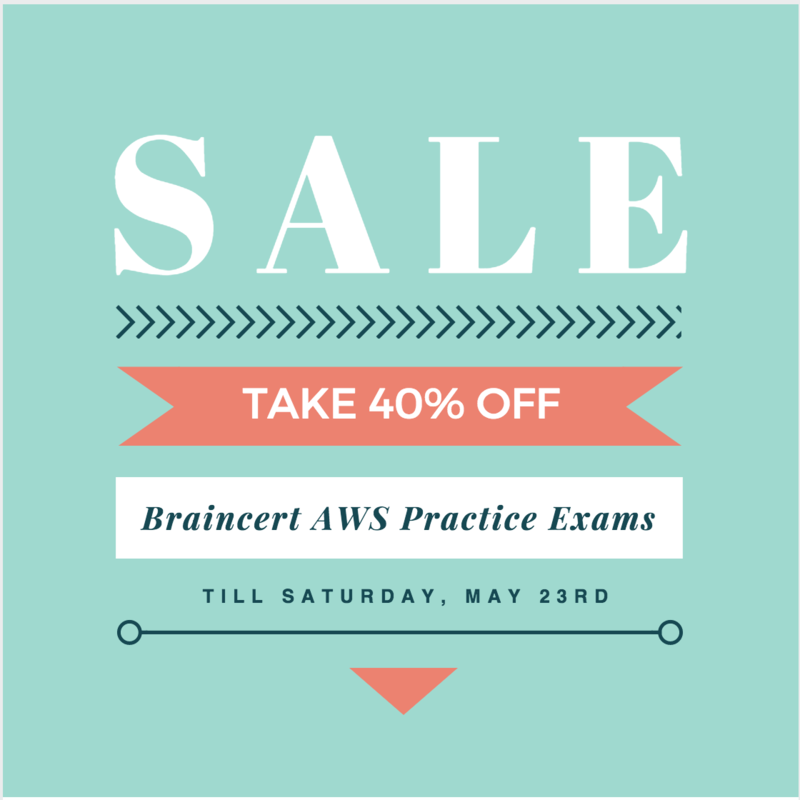 Also note, AWS exams do not reflect the latest enhancements and dated back. what is the solution for RDS – Oracle / MS SQL for multi region Disaster Recovery ? what is the minimum RPO i can commit . Had read a good article regarding multi-region RDS Oracle solution. Also, mentions RPO calculations. In the question bellow, how will the new RDS integrated with the instances in the Cloud Formation template ? you can hardcode the endpoint of database or pass it as parameter or configure it as a variable or even retrieve it from it in the CloudFormation command. Thanks for your great web! It helps me a lot to pass SAA by reading it. What is the answer for below question in your opinion? I think both A and B sound good, but I don’t know how to select between A and B. 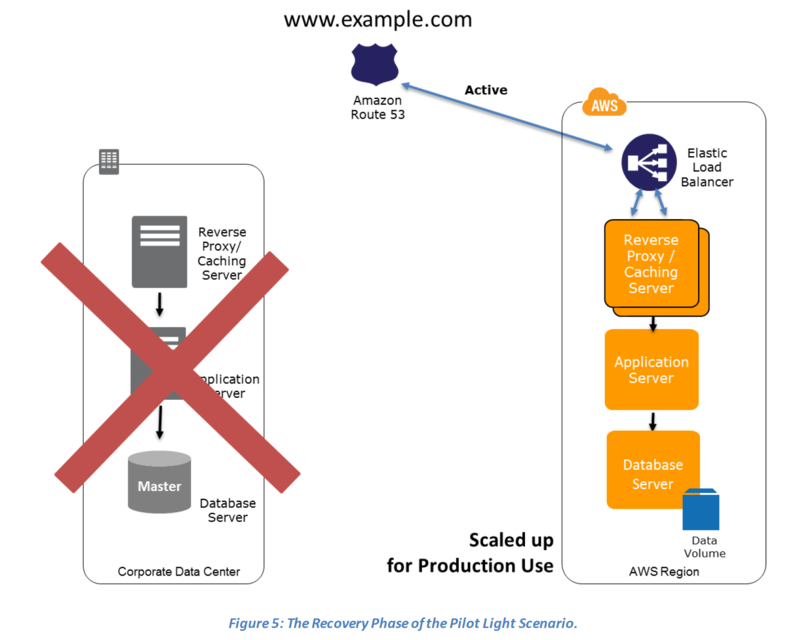 A Solutions Architect needs to use AWS to implement pilot light disaster recovery for a three-tier web application hosted in an on-premises datacenter. Which solution allows rapid provision of working, fully-scaled production environment? A. Continuously replicate the production database server to Amazon RDS. Use AWS CloudFormation to deploy the application and any additional servers if necessary. B. Continuously replicate the production database server to Amazon RDS. Create one application load balancer and register on-premises servers. Configure ELB Application Load Balancer to automatically deploy Amazon EC2 instances for application and additional servers if the on-premises application is down. C. Use a scheduled Lambda function to replicate the production database to AWS. Use Amazon Route 53 health checks to deploy the application automatically to Amazon S3 if production is unhealthy. D. Use a scheduled Lambda function to replicate the production database to AWS. Register on-premises servers to an Auto Scaling group and deploy the application and additional servers if production is unavailable. Option A as with Pilot Light you only the critical data is replicated and the rest of the infra should be reproducible.